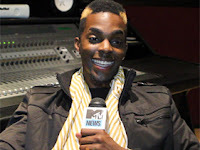 Roscoe Dash aired some of his grievances with the music industry on Twitter last week — specifically, not getting proper credit for his work on hits like Wale's "Lotus Flower Bomb," and Dash told MTV News he was simply trying to show the public what happens behind the scenes. During a heated Twitter spree, Dash made it known that he'd penned the chorus to Wale's #1 single "Lotus Flower Bomb" (even though Miguel sang the hook) and said he's gotten no credit. Similarly, Dash said he contributed to G.O.O.D. Music's Cruel Summer track "To the World," and while his ad-libs can still be heard on the final product, he was not credited along with Kanye West, R. Kelly and other producers. "I just want people to understand what people have to go through in the industry, what we have to deal with on a day-to-day basis," Roscoe told MTV News, explaining why he lashed out on Twitter. "No matter who you are, no matter what you've done in the past, it's a dirty game." The 22-year-old added that he often assists people on their own projects as a means of escape, and that sometimes backfires. "People like myself who are generous, we like to go out and participate in other people's stuff. We like to keep our hands in a lot of different things rather than just worry about one specific thing, which would be ourselves," he said. "Me particularly, just because of the past stuff I've been going through with my personal career, [I thought] maybe I don't have to worry about this right now. F--- talking about the album: Let's go and do something else over here and get my mind off of this for minute so when I come back I have a clear head [and know] what I wanna do. [But] we get walked on a lot, and I just want people to know that it happens. Plain and simple." Dash certainly got the attention of Miguel, who addressed the Twitter accusations in an interview with Complex, calling Dash's claims "retarded," as well as Meek Mill, who took a quick jab at him writing, "Yo @Roscoedash u must not b getting no money b! Lol." Thus far, Kanye has not publicly responded to any of Dash's tweets.